Holes in the leaf canopy project images of a solar eclipse on the ground. A pinhole camera is a camera without a conventional glass lens. An extremely small hole in a thin material can create an image when all light rays from a scene go through a single point. In order to produce a reasonably clear image, the aperture has to be about 1/100th the distance to the screen, or less. 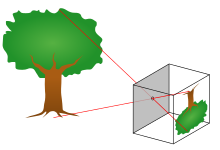 The shutter of a pinhole camera usually consists of a hand operated flap of some light-proof material to cover and uncover the pinhole. A common use of a pinhole camera is to capture the movement of sunlight over a long period of time. This type of photography is called Solargraphy. Pinhole cameras require much longer exposure times than conventional cameras because of the small aperture; typical exposure times can range from 5 seconds to hours or days. The image may be projected on a translucent screen for real-time viewing (popular for viewing solar eclipses; see also camera obscura). Very early in history (as far back as 500 B.C. ), Greeks such as Aristotle and Euclid wrote on naturally-occurring rudimentary pinhole cameras, for example light may travel through the slits of wicker baskets and the crossing of leaves  The ancient Greeks, however, believed that our eye emitted rays which enabled us to see. What enabled a much better understanding of the pinhole camera was the discovery that light enters the eye rather than leaving it. It was the 10th-century Muslim mathematician, astronomer and physicist Ibn al-Haytham who published this idea. ↑ "Light Through the Ages". This page was last changed on 28 November 2018, at 12:33.